Some adverts for Domino Industries. Last edited by Denv12 on Sun Feb 23, 2014 5:55 pm, edited 1 time in total. This Melton factory would have been small for a bus and coach factory.They wouldnt get many in there. That was only the shed fronting Melton Rd, there were more behind that one. Maladjusted wrote: That was only the shed fronting Melton Rd, there were more behind that one. I'll take at look at Google maps,I missed the rest. Was about to say they built 205 Panthers within about two years, so it must've been reasonably big! The photo with the 2 Deluxe Tourmasters facing in opposite directions,what roadhouse was that taken at? It looks familiar? Here is a variety of photos and adverts.Can anyone else contribute history? Last edited by Denv12 on Sun Feb 23, 2014 12:03 pm, edited 1 time in total. 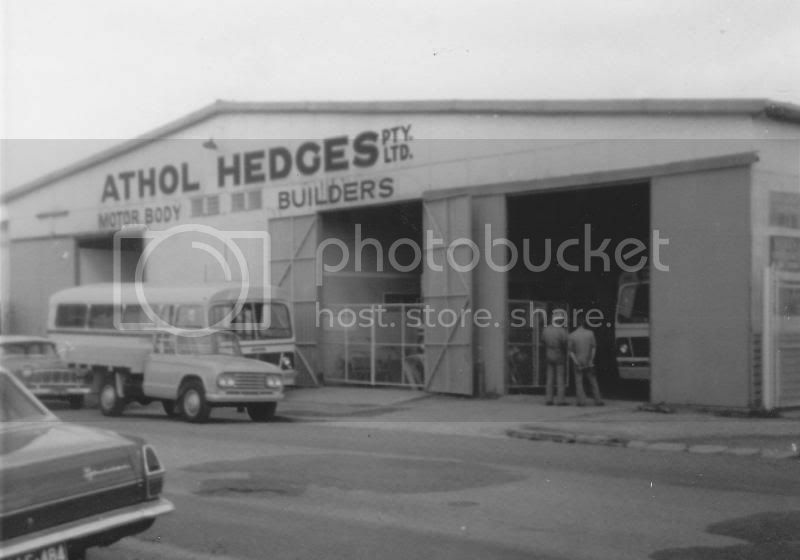 Athol Hedges did his apprenticeship with W.S. Grice of Summer Hill, NSW, who may have been a relative, he later worked for Charles Hope in Brisbane, at sometime during the war he set up a business at Eve Street Sandgate manufacturing Gas producers, at the end of the war he was involved in building two buses for HHBS, No24 a semi trailer bus which was built in Hornibrook's large shed in Rainbow Street and No 16 a LHD White WA20 which was built at the Eve Street premises, I doubt if Hedges was ever an employee of Hornibrook's, the buses HHBS built were composite, wood frame, tongue and groove roofs covered with malthoid and canvas, with steel sheeted sides, Hedges worked in steel.I wonder how much of the structure of these two buses came from Comeng which was a company set up by the government to produces bodies for all, read Hartnetts "Big Wheels, Little Wheels". Hedges didnt supply any more buses to HHBS until 1956 with the delivery of two Leyland Comets with regular sales of buses to them thereafter, in the period between 1945-56 buses were built for HHBS by themselves,CAC, Charles Hope and F.H. Shuttlewood. Hedges set up Athol Hedges P/L circa 1947 with a move to Earnshaw Road, Northgate with a later move to 343 Melton Road, Northgate. Car177 wrote: Athol Hedges did his apprenticeship with W.S. Grice of Summer Hill, NSW, who may have been a relative, he later worked for Charles Hope in Brisbane, at sometime during the war he set up a business at Eve Street Sandgate manufacturing Gas producers, at the end of the war he was involved in building two buses for HHBS, No24 a semi trailer bus which was built in Hornibrook's large shed in Rainbow Street and No 16 a LHD White WA20 which was built at the Eve Street premises, I doubt if Hedges was ever an employee of Hornibrook's, the buses HHBS built were composite, wood frame, tongue and groove roofs covered with malthoid and canvas, with steel sheeted sides, Hedges worked in steel.I wonder how much of the structure of these two buses came from Comeng which was a company set up by the government to produces bodies for all, read Hartnetts "Big Wheels, Little Wheels". Last edited by Denv12 on Sat Feb 22, 2014 9:15 am, edited 1 time in total. There's no doubt that at the very least there will be a very informative article on Athol Hedges - as there are copies of a recorded interview with him that the Transport Researchers conducted before he passed. It will certainly clear up a lot of opinions about how he started and whether it was or wasn't for Hornibrook. I'd be in that.Add me to that list.Needs a new topic posted on them to see who would by them then send them the link so they can see how popular they are and to go ahead and make them.As for which coach companies they should be in lets start making a list. Last edited by Denv12 on Mon Feb 24, 2014 5:50 am, edited 1 time in total. Some for adverts.And more to add. Last edited by Denv12 on Sun Apr 13, 2014 4:03 pm, edited 1 time in total. ...70s Domino slab front (aka Tourmaster 1) with early 'TM' sticker..
Hi Chip. Thanks for posting here. Just something to think about,if you could share your knowledge with the right people who could then put a book together I'm sure you would get a few buyers here on this forum. This history of your dad's company and how it evolved is of interest to us. Thanks. Just dug up this thread while looking for some info on Hedges and Domino. Although it's primarily about buses, it was mentioned that they also built fire trucks. About a dozen of these were built for various Qld brigades on Ford R bus chassis, and utilized bodies made almost entirely of fibreglass. Production started around 1970 and carried over into the Domino era. Fast forward to 1990, and Austral designed a new fire truck using a similar "walk in" bus cab design, but using Tourmaster technology to create and integral vehicle. Production of these continued until the fold up of 1998, and the design was taken over by Varley Engineering of Newcastle.